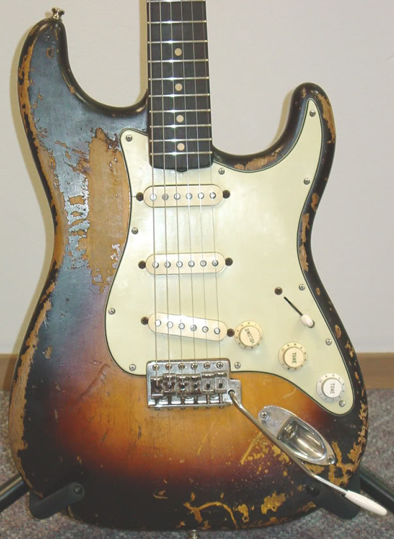 McCready has played numerous guitars during the 20 year history of Pearl Jam, but is most closely associated with this well-worn 1959 Strat. 1959 Strats are highly prized (and priced) as this was the year the new rosewood fingerboard provided a richer tone, the neck got a bit thinner, and the thicker pickguard was now made of celluloid. Before 1959, Strats had a two-tone sunburst pattern; in 1959 the two-tone was traded in for a three-tone sunburst with the addition of red. However, after a few years these were back to a two-tone look, as the red paint Fender used tended to fade with light exposure.